A huge hit in our class, ideal for encouraging food tasting. (We have alot of sensory issues. This makes the experience less stressful and fun. I always use a set (just bought a replacement and thought I'd share) at home with the munchkins while they are preparing their lunch / dinner with me ( they are sharp supervision and guidance highly recommended) . It makes meals so much more interesting and I find it's all gobbled up! These aren't on offer, I however thought it was a good price. SHAPES OF CUTTER SET: 12 different shapes and sizes, including star, rabbit, bear, bird, fish, flowers and heart shapes. Give you more options to do your DIY. 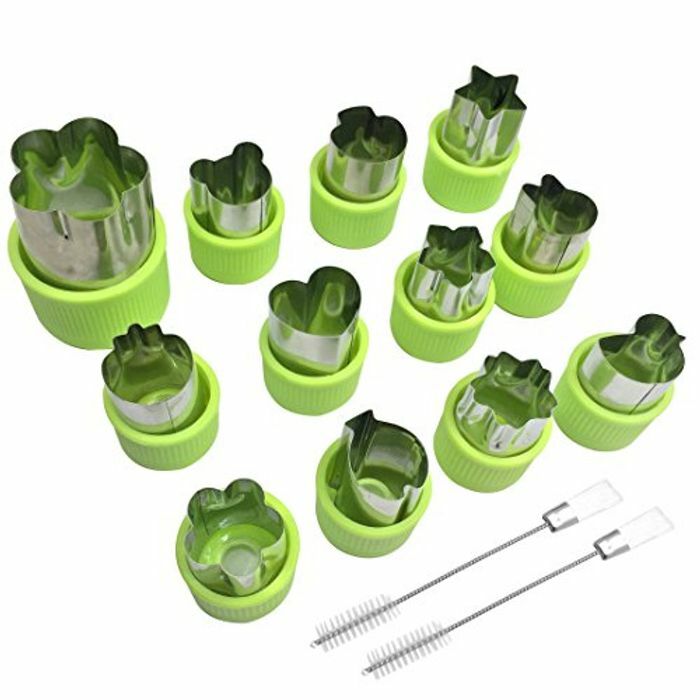 WIDELY USE: These cutters help to make your food into cute shapes easily, suit for meals, cookie, cake, sushi, fruit, vegetable, pudding, butterfly noodle and more. MATERIAL: Cutter Set---High quality stainless steel + plastic, Cleaning Brush---Stainless Steel + Nylon. EASY TO CLEAN: The dishwasher is safe and can be cleaned with soap. It is recommended to dry after use and pay attention to drying. This can prevent rusting and prolonging service life.